INDIANAPOLIS -- For 11 seasons as a player, Curtis Martin never sought the spotlight. On Saturday night, it finally found him -- and he didn't mind one bit. Martin, the quiet, dignified and tough running back who helped legitimize the New York Jets in the late 1990s, was elected to the Pro Football Hall of Fame in his second year of eligibility. He joined Joe Namath, Don Maynard and coach Weeb Ewbank as the only Hall of Famers who carved their legacy with the Jets. It could've been a New York-New York party, but former Giants and Jets coach Bill Parcells -- a two-time Super Bowl champion -- wasn't among the five modern-era inductees. The others were Dermontti Dawson, Chris Doleman, Cortez Kennedy and Willie Roaf. 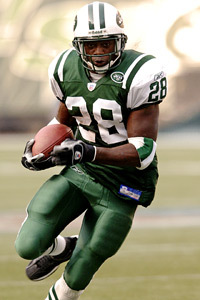 Curtis Martin rushed for 14,101 yards, gaining 4.0 yards per carry. Jack Butler, a Steelers cornerback from the 1950s, was also elected. Martin, who last played in 2005, became the 29th modern-era running back elected to the Hall. He's the fourth-leading rusher in NFL history, with 14,101 yards. This caps a remarkable football journey for Martin, 38, who didn't play organized ball until his senior year at Taylor Allderdice High School in Pittsburgh. He scored on a long run the first time he touched the ball, and he never slowed down, going from Pitt to the New England Patriots to the Jets. Martin was the embodiment of consistency and durability. He wasn't the biggest or the fastest runner, he didn't make many highlight-film plays and he rarely drew attention to himself with silly touchdown dances. But he showed up every Sunday and performed at the highest level for a decade. He cracked the 1,000-yard mark as a rookie with the Patriots, and he kept churning them out, all the way to 10 in a row. The only other player to rush for at least 1,000 yards in each of his first 10 seasons is Barry Sanders, a Hall of Famer. Martin's signature season came in 2004, when he claimed the league rushing title with a career-high 1,697 yards. He was 31, the oldest player to win a rushing crown, delivering his best at a time when most backs are either retired or barely hanging on. He probably could've kept going, too, but Martin suffered a knee injury early in the 2005 season. He played through the pain -- he once said it felt like chards of glass inside his knee -- but he finally broke down late in the year, ending his streak of 119 consecutive starts. He never played again. Martin was always concerned with team, not self -- and that will be his greatest legacy. He made a stunning gesture during a slump in 2003, saying he'd gladly take a seat on the bench if the coaches felt it would help the team. How many superstars would do that? The coaches stuck with him, and he still ended up with 1,308 yards. His humility was -- and still is -- legendary around the Jets. Martin once said he liked to pick up used towels off the locker-room floor once a week because it kept him humble. To honor him, the Jets named their team MVP award after him. It's rare for a non-quarterback to impact a franchise, but Martin did just that -- two franchises, actually. After three seasons with the Patriots, he followed Parcells to the Jets, signing a clever and complicated offer sheet that made it almost impossible for the Patriots to retain him. Parcells' heist intensified the acrimony between the two bitter rivals, yet Martin somehow remained above the enmity. It wasn't your typical athlete-franchise divorce, as Martin has maintained a strong relationship with Patriots owner Robert Kraft. Truth is, you'd be hard-pressed to find a negative comment about Martin from anyone -- former teammate, opponent, anyone. With Martin and Parcells in New York, the Jets took control of their rivalry with the Patriots, reaching the AFC Championship Game in their first season reunited, 1998. It came only two years after their 1-15 debacle. The Patriots sagged until Bill Belichick and Tom Brady started winning championships in 2001. Perhaps the best snapshot of Martin occurred on a practice field, with no crowd and no teammates around. This was in July 2004, before training camp opened. Former general manager Terry Bradway looked out his window, and saw a solitary figure -- Martin -- walking through his plays, over and over. A simple, yet telling moment from a Hall of Fame career.